We all hope that October and November will bring some much needed rain, especially so after our last very dry winter and the recent severe fires. Here on the Algarve we are eagerly awaiting our second spring when the rains should wash the landscape free from dust and encourage the greening which so swiftly follows the first rains. After rain to open the ground , it is the perfect time for planting the majority of plants, trees, shrubs, perennials and hedging plants, while there is warmth and moisture in the soil. Autumn plantings generally are better placed to withstand drought the following summer than spring plantings. Exceptions to this are tender plants such as plumbago and bougainvillea, spring planting helps to get their roots down before dealing with winter cold. 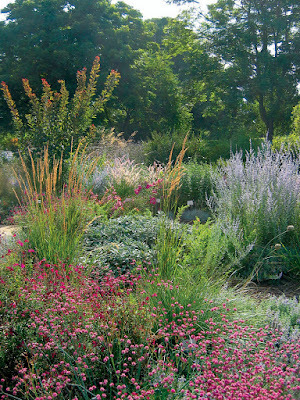 Most plants, even if drought resistant, need supplementary watering during their first summer or two. Making the traditional bowl or caldeira around the new plant helps by channelling water to the roots. Give copious summer water at fortnightly or monthly intervals to encourage root development downwards. When you are choosing new plants remember the hot, dry summers, possibly with six months of the year without rain. The occasional quite cold winters in much of the higher hills of the Algarve and, for many, strong winds, also pose a challenge. Check on the drought tolerance and winter hardiness of plants you are interested in. Choose plants which come from mediterranean climate zones of the world rather than tropical or temperate zone plants; they will perform better and require less watering. Best of all, if you are repairing damaged landscapes or garden areas, look at the magnificent palate of native plants – yes, those looking at you right now over the garden wall – still green after 18 months of reduced rainfall. When planting remember to dig a square hole about twice the depth and twice the width of the pot the plant came in (or root ball if you are planting a bare root plant), mix the excavated soil with some organic material such as compost or potting soil and some sand or gravel and use this mix to backfill the planting hole. First, unless the weather has been wet, fill the planting hole with water and let it drain away; meanwhile standing the plant in a bucket of water so that the root ball is moist. Check also that the root ball is not deformed from too long in the pot, ease out the roots gently after soaking. Then, half fill the planting hole with your soil/compost/sand mix, place the plant, spread out the roots and fill around the sides with the soil mix and firm into place. This might also be the time to mulch the immediate area or the watering bowl to aid moisture retention through sunny winter days. Do not water or mulch heavily too close to stems as this could cause rot, especially so with sub-shrubs such as lavender, rosemary, phlomis, cistus etc. Keep an eye on the water requirements of your newly planted items. For taller shrubs and trees you may well want to use a stake so that it isn’t rocked by winds. The stake should be placed so that the prevailing winds blow the plant stem away from the stake. Note that the late autumn is also the best time for any transplanting you want to do. This is my favourite time for moving very small native plants which have germinated in the garden and which can be moved before they put down their tap roots. Small seedlings with only four or five leaves can be moved once the ground has had the first good soak. planting bulbs - in general plant the bulb at its own depth and allow at least 5cm between bulbs, more for larger bulbs. Remember to check flowering times so that you maximise the season of interest and mark where you have planted the bulbs ….. in my garden any gap is fair game for another plant !